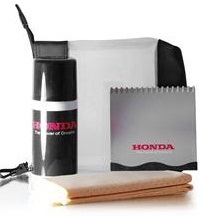 Promote with absolute style this winter - our new Winter Driving Set for business gift. Not just any Promotional Driving Set - this one has excellent quality and class within its contents. Armed with a 150ml de-icer spray, Chamois leather - a very smooth and absorbent cloth to clean and will polish without any streaks, and a square branded icescraper - all in a reusable automotive zip top bag. The most ideal frost and winter business gift. Ensure safe driving with customers and clients, and Promote your brand name and logo on the items provided in this safe driving Winter driving set for a business gift. Its a good idea to order these quickly and hand them out at business conventions and trade fairs - promote safe driving and ensure exposure of your company in the most effective way possible. Tools like these are used often and frost will be an issue this christmas and during this winter. For a FREE QUOTE please fill in our contact form regarding our Winter Driving Set for business gift and we'll be able to help you.